Bhutan, a land of rich biodiversity is a home for a variety of wild plants that are used as food, fibre, fodder and medicine. Owing to the seasonal nature of these wild plants, one can see different species appearing and disappearing in the local markets through out the year. 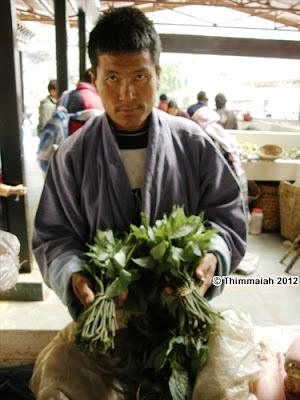 The native population relish the wild vegetables and is a part of the Bhutanese traditional cuisine. During the winter months one of the most popular wild plants used as a vegetable soup is Elatostema lineolatum which is known as ‘Dumroo’ in the local language. ‘Dumroo’ belong to the family of stinging nettles (Urticaceae) but they don’t have any stinging properties. It is a medium sized herb about 30 centimetres height. The leaves are greyish to greenish colour and the stem is very succulent green and at times greyish brown colour. A large native population in Bhutan live in remote hamlets in the mountains and have a very good knowledge of the biodiversity of their region. They have to trek for few days to reach their villages. While they are resting during the long treks, it is customary to have ‘Dumroo’ soup as it relives body pains and also these plants are easily available in the forests. 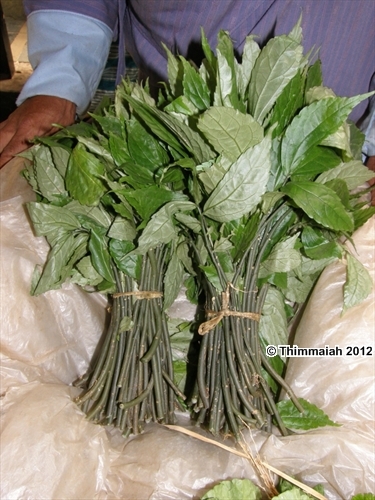 They believe that Elatostema lineolatum has lot of medicinal properties and builds immunity. 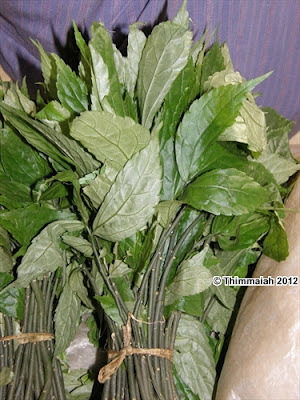 Probably it may be true as the stinging nettles are the rich source of iron and magnesium and in traditional systems of medicines they are recommended for anaemic patients. In the north eastern parts of India which share similar geographical conditions as Bhutan, Elatostema lineolatum is used as a medicine. The leaf paste is applied on the wound and the locals in Assam region of India say that it works like a miracle. There is a need for more detailed scientific studies to establish a link with the traditional knowledge. However, people in Bhutan enjoy the soup of ‘Dumroo’ and are not waiting for scientific research to prove and ratify its benefits. Elatostema lineolatum starts appearing in the vegetable markets in Thimphu, capital of Bhutan through out the year. But it is in high demand from September to January months. They are sold in bunches and each bunch comprises of 40-50 plants. Each bunch is sold at 20 to 25 Ngultrums ( approximately 50 US cents). It’s amazing to see and learn the use of ecofriendly practices employed by the farmers who sell these wild plants. These ‘dumroo’ plants are made into bunches by tying with a local grass or a natural fibre like jute. Some farmers reuse the old polythene bags by cutting them into strips. The ingenuity of the native people in making the best use of the natural resources needs to be appreciated. ‘Dumroo’ is most popularly used as a soup in Bhutan. The leaves and the succulent stems are cut into small pieces and boiled in water for 5-10 minutes. A small quantity of butter or cheese and salt is added to the boiling water. Some even add chillies according to ones taste. The hot soup is served during meals and provides a great solace in winter as it warms up the body. It tastes slightly bitter which is relished by the Bhutanese. Some people believe that this soup is good for those who are recuperating from some health ailments. The rice is put in a rice cooker with 450-500 ml of water. Chopped ‘dumroo’ plants, turnip/radish and one teaspoon of salt are added and the rice is cooked. It is considered to be good for health. Some farmers say that during the shortage of rice, to add up the bulk this method is employed. Isn’t it a wonderful adaptation strategy for survival during tough times with the knowledge of biodiversity? I have tried to use Dumroo as a vegetable fry and it tastes very good. You can try this method and it goes well with most of the green leafy vegetables. Wash the bunch of ‘dumroo’ thoroughly in clean running water. Cut them into pieces of size 3-4 cms length. Heat some vegetable oil in a pan and put one or two chopped onions, two flakes of crushed garlic, 2-3 tomatoes and chillies according to taste. Fry this mixture till the onions and garlic turn golden brown. Now add the chopped ‘dumroo’ and fry for about 10 min till it is properly cooked. Add salt according to taste and serve hot. If you don’t relish the bitter taste, add 2-3 tablespoons of balsam vinegar or tamarind paste. It goes well with bread, rice and also can be topped on pizza. The traditional knowledge of biodiversity is very helpful in reducing the pressure on food production. Woefully, research and policies are attuned to the main crops like wheat, rice, potatoes and maize while a large number of traditional crops which were the main sources of livelihood of the rural population world over are forgotten. There is a need to educate the research organizations, policy makers and masses on traditional wisdom of living in harmony with nature and sustainable use of natural resources. With the ongoing climate change impacts on food production, the traditional knowledge on biodiversity and food are ‘climate smart’ approaches to combat hunger and suffering. Next time when you are in Bhutan during winter don’t miss ‘Dumroo’.